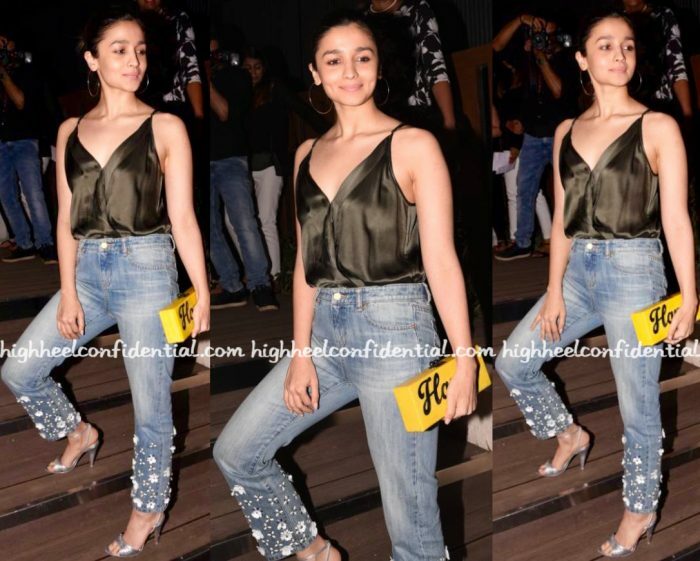 For an appearance at a recent restaurant (designed by Gauri Khan) launch, Alia chose to denims! Pairing her Michelle Mason camisole with a pair of embellished Michael Michael Kors denims, Alia finished out the look with an Edie Parker clutch and Zara sandals. She wore the look with an effortless ease; Alia looked good! Shop the Michael Kors jeans here and the Edie Parker ‘Happy’ clutch here. melikes the jeans! they r a very current fit, the medium rise and straight fit. the outfit needed wayy more interesting heels. why would u pick these?? She has been favouring such camisole type tops of late. Her last 3 appearances has her wearing such kind of tops. I like this. One of those times when you see alia accessorising – referring to hoop earrings. Because camisole is baggy, fitted denims (minus that embellishment) would have looked better & perhaps slightly brighter lips. In the 3rd pic, she looks like a spitting image of Soni Razdan. No ways she looked good here, what is happening to Alia? Not a single look in last many months that had a wow factor, here she looks like a below average dressed girl !! The look, overall, is underwhelming, yes! 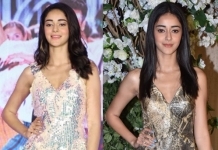 I have observed she has an affinity for washed out or muted shades (her looks in movies like 2 states, humpty sharma, badrinath are quite the opposite). She dresses her age but none of her looks so far have been memorable to me. She clearly plays very safe! Not a fan of those jeans. But she looks lovely as ever. This muted style works for her with the slight pop of color via the clutch. She has started adding some accesories which is a slight change from her usual looks. I think she is getting a bit overconfident in thinking she can get away with anything. I love those jeans! They deserved a better top…white off shoulder crop top maybe. But I do enjoy this gal’s minimum make-up looks.